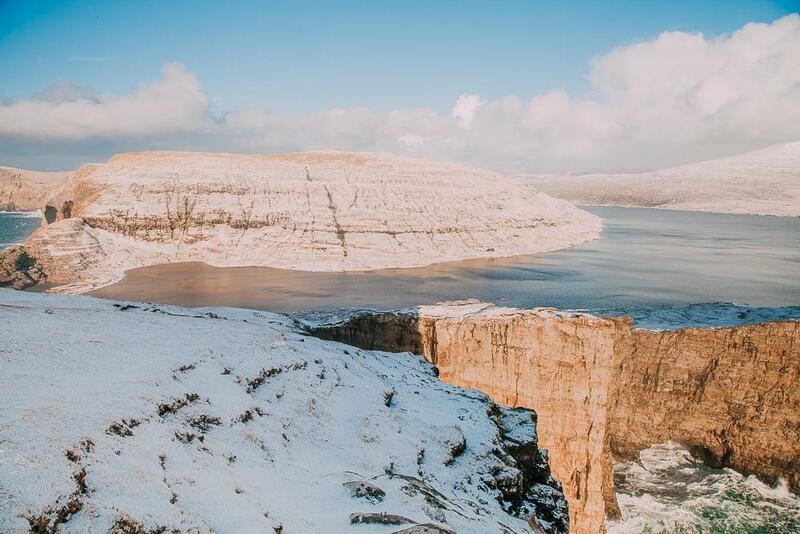 If you follow me on Instagram you might have seen my photos from my trip to the Faroe Islands in February. It’s taken me a while to actually sit down and write about it because I had so many photos and video clips to go through. And to be honest, I haven’t done a great job of narrowing down my photos – get ready for a lot of pictures in this post. Sorry! 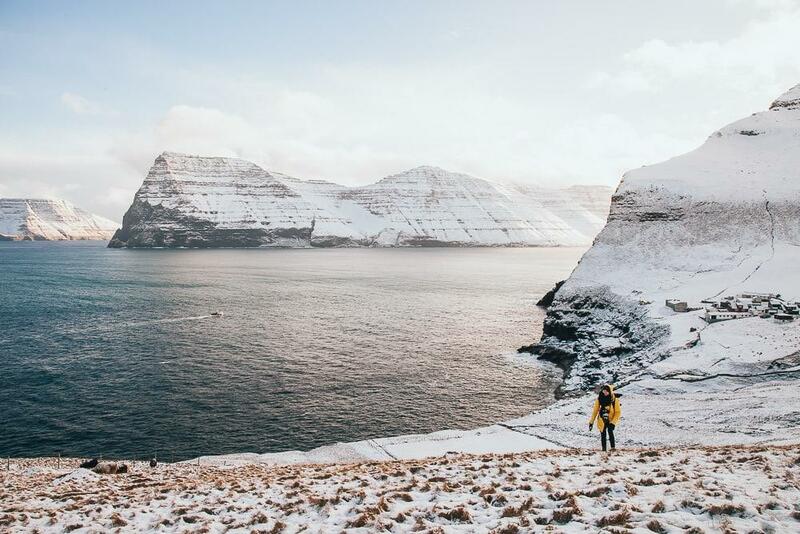 When I arrived on the Faroe Islands I had one goal: to see as much of the islands as I could in the space of six days. Now, usually this would mean having a carefully planned out itinerary, so that I wouldn’t waste any time driving back and forth or figuring out my next move. 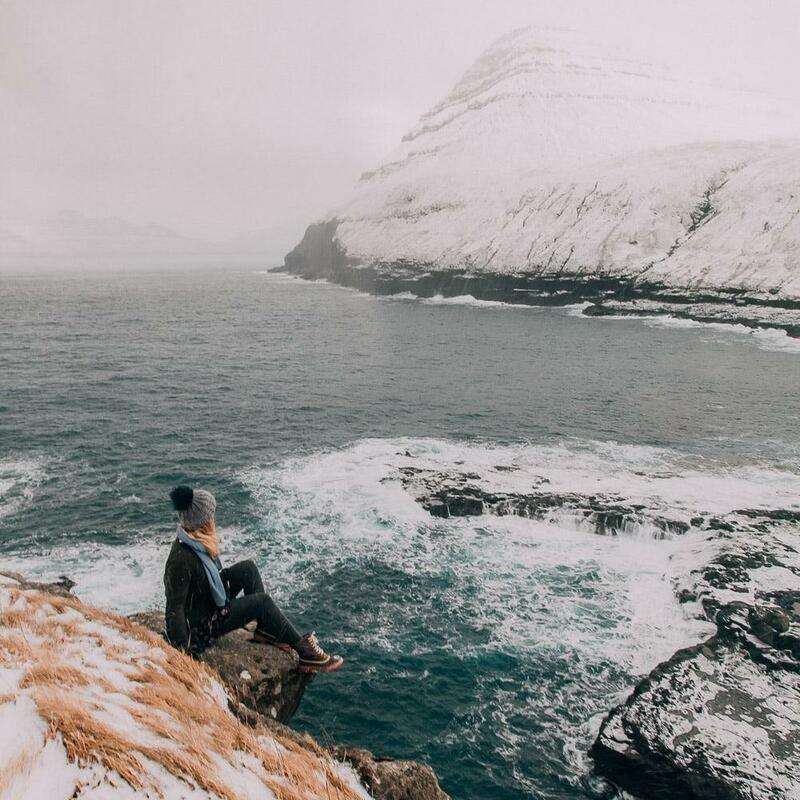 Except this was the Faroe Islands and as I soon learned, the best plan here is to be as flexible as possible. 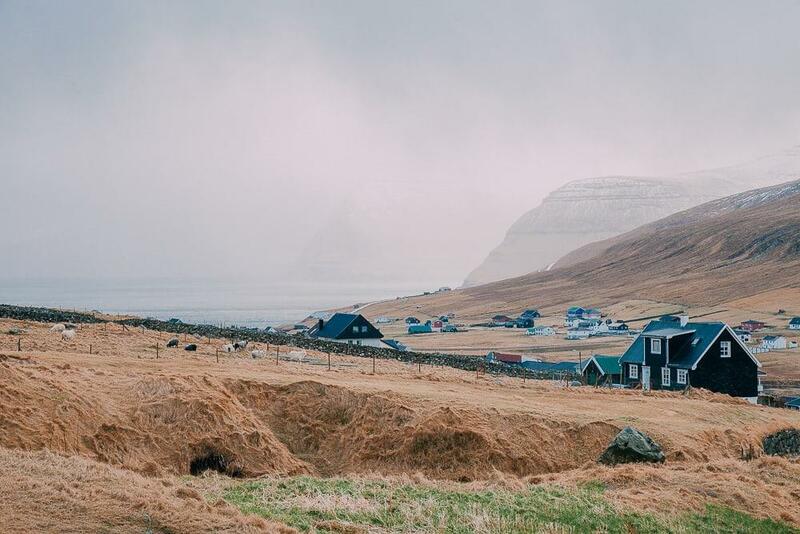 The good news is that distances on the Faroe Islands are surprisingly small. You can get most places on the islands within an hour or so. And this means that you can deal better with the bad news: the weather. 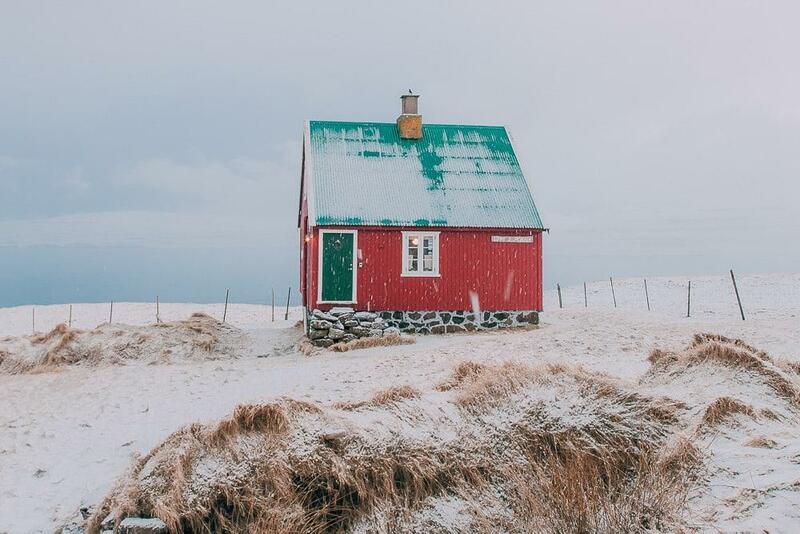 The Faroes have a lot of weather, especially if you’re there in the winter. 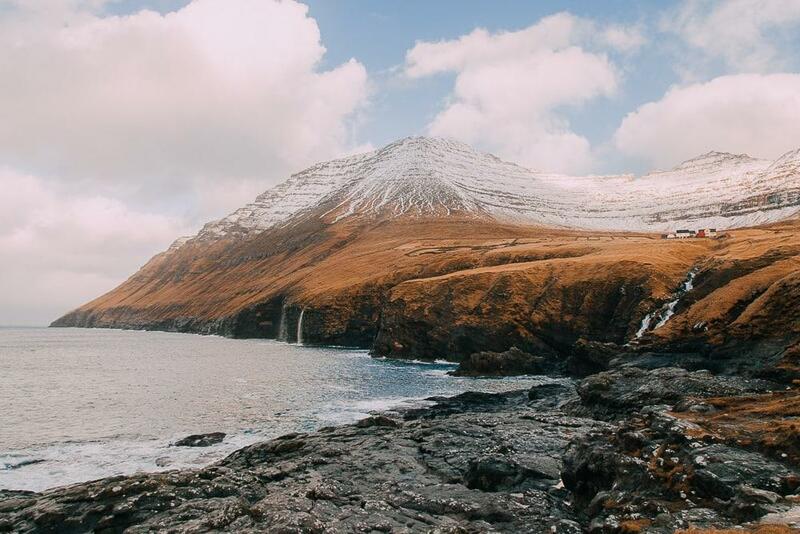 And since my main reason to visit the Faroe Islands was to see the beautiful landscape and go on hikes, instead of organizing my itinerary according to location and time, I organized it according to weather. Basically, I made a list of the places I wanted to visit and then I ranked them, deciding to go the the prettiest locations on the days with the best weather. But I wish I had also known which hikes actually required good weather, and which were still doable in the rain/snow. So here are all the places I visited on the Faroe Islands, from those requiring the best weather to those that are still lovely in a storm. 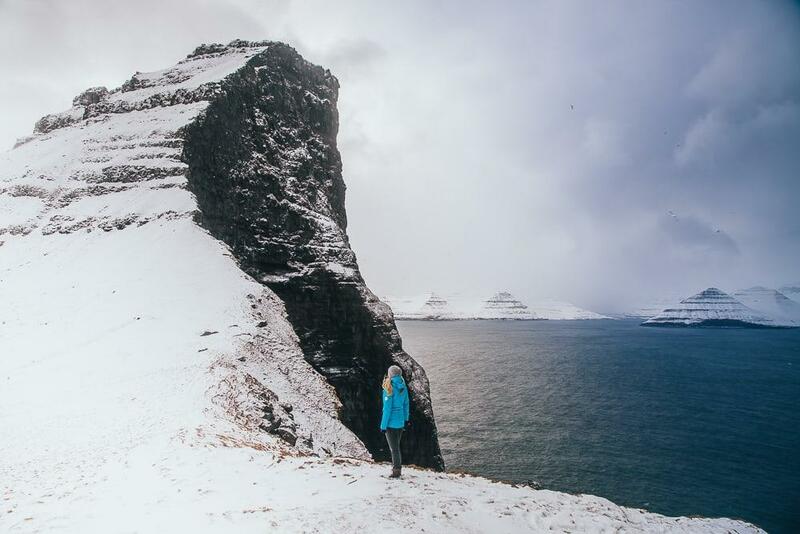 If I could only have had good weather for one excursion on the Faroe Islands, I would have wanted it to be for the hike to the Kallur Lighthouse – not only because the views there are so incredible, but also because the hike is a little tricky. 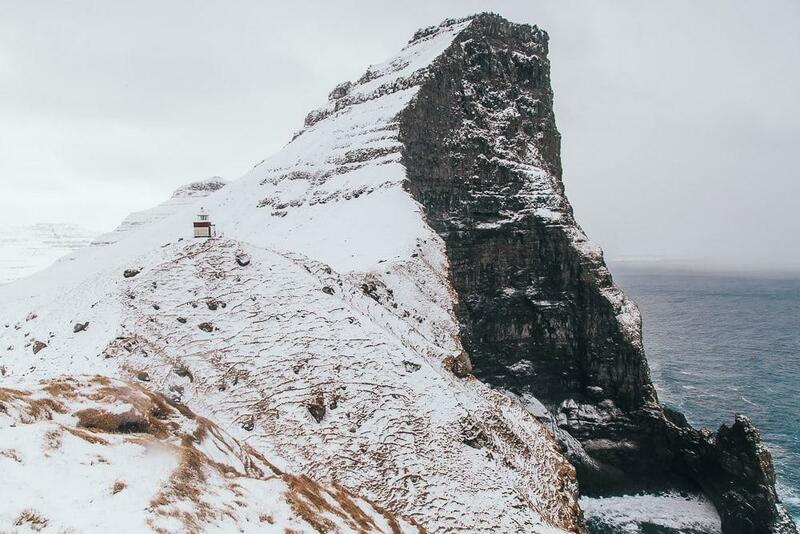 The hike to Kallur Lighthouse isn’t very long or steep, but because there’s no set path (at least in the winter) it can be quite slippery, especially in the snow. I’d say I fell about 30 or 40 times? Though my friend Teru only fell once or twice, so maybe I’m just clumsy. Or it was my boots! Wear footwear with really good grip, people! And then if you want to see the lighthouse from its most famous angle, with the jagged cliff behind it, you’ll have to cross a narrow path that has steep drops into the sea on either side of it, so ideally you’ll want to do this when it’s not super windy and raining. This was seriously one of the scariest 10 meter walks of my life. And I didn’t even really walk it – I was mostly crawling the whole time. 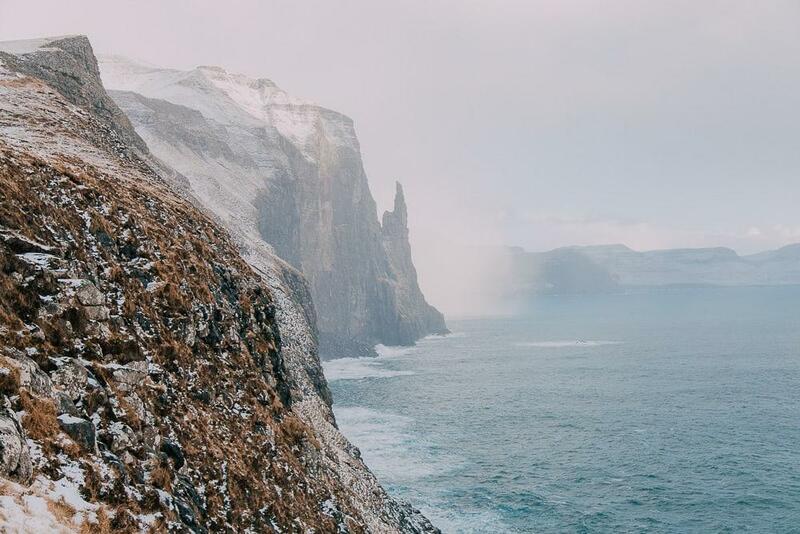 I definitely would not want to attempt it in bad weather, but it also would be such a shame to make it all the way to the Kallur Lighthouse without getting the most famous view with the jagged mountain behind it. And then on the walk back down the mountain I got a bit of vertigo. It’s not actually that steep, but there are no trees or even bushes to stop your fall if you do slip, so it looked like you could just slide down the mountain. Which again is why I’d really try to do this hike in good weather. 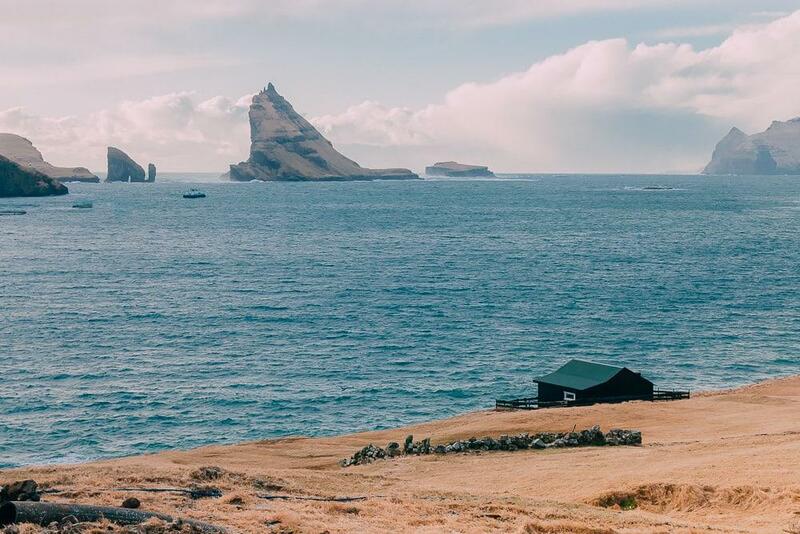 To get to the lighthouse you’ll need to get the ferry to Kalsoy, which leaves from Klaksvik and goes to Syðradalur. Kalsoy itself is tiny, so you won’t need much time here aside from the hike. You can find the Kalsoy ferry schedule here. I don’t think you need to arrive much earlier than 15 minutes in advance unless it’s really crowded, and you can pay on board with cash or a credit card. And then from Syðradalur it’s about a 20 minute drive to Trøllanes, where the hike to the Kallur Lighthouse starts. 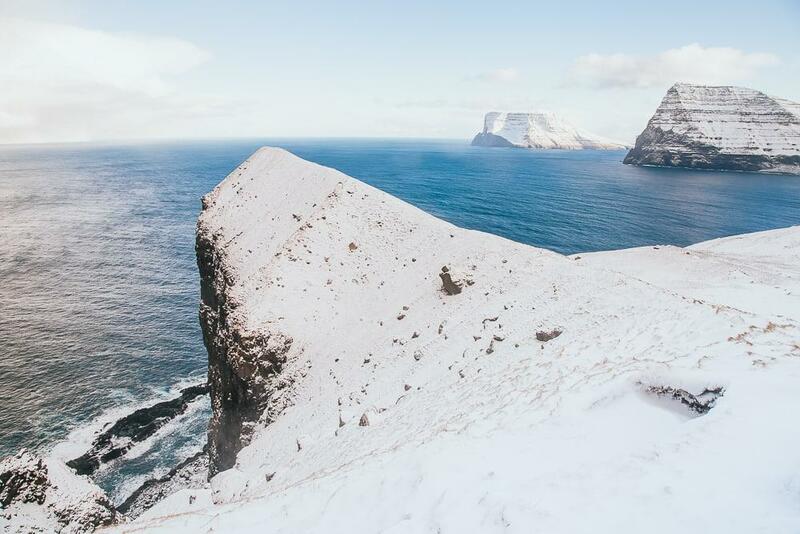 At 880 meters tall Slættaratindur is the highest mountain on the Faroe Islands. 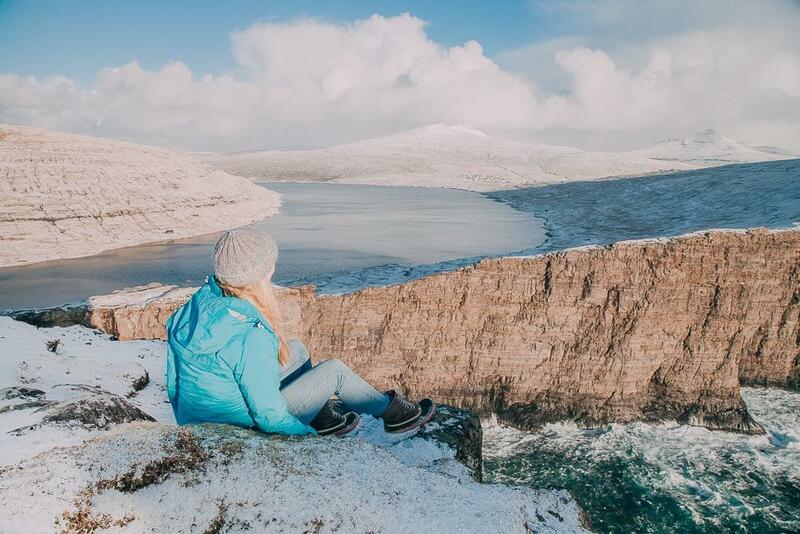 Apparently on a clear day you can see all of the Faroe Islands from here, and on the clearest of days you can even see all the way to Iceland – something that earns the mountain a Guinness World Record as the object of the world’s longest sight line, 550 kilometers from the Vatnajökull glacier in Iceland. I really wanted to climb Slættaratindur, especially as if you start from Eiðisskarð (you’ll see a sign for it in Eiði), the hike is only about 500 meters uphill. Easy, right? Uh, not when there’s a foot of fresh snow on the ground. That combined with Teru not having gloves and it being really cold on top of that mountain meant that we couldn’t make the climb. But I’d love to return in the summer someday to do it! 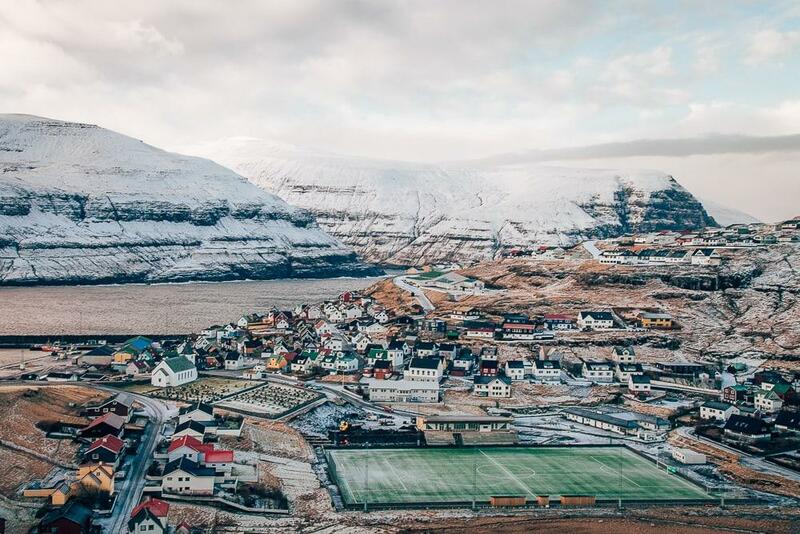 Also, if you approach Slættaratindur from Eiði you can see what must be one of the most picturesque football pitches – I certainly think it rivals the famous one in Lofoten. 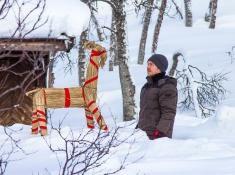 The woman at the tourist information office at the airport said that the Slættaratindur hike actually often is doable in the winter, so we were just unlucky with the amount of snow. Or super lucky? 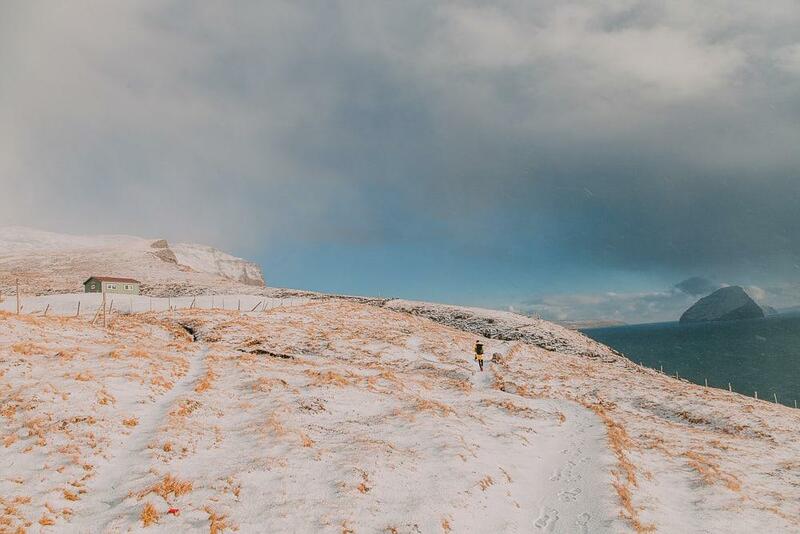 I mean, the Faroe Islands in the snow are gorgeous! And then from Eiðisskarð you can drive on to Gjógv, which is another reason you’ll want really good weather today. The road to Gjógv is narrow and already made for some tricky driving on the clear day I drove there. 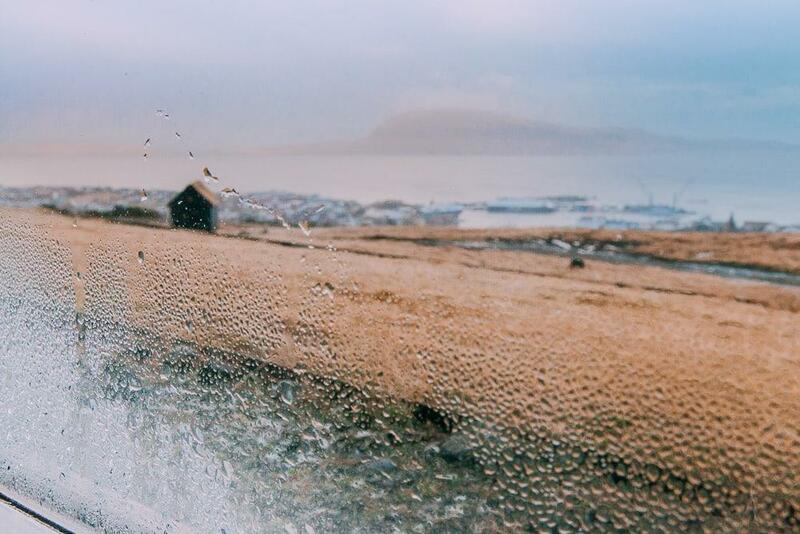 Well, it started as a clear day – by the time I got to Gjógv it was snowing again. I actually came back here in July on a beautiful day and I have to say, Gjógv is stunning in the sunshine. Then again, I found it pretty stunning in the snow as well. 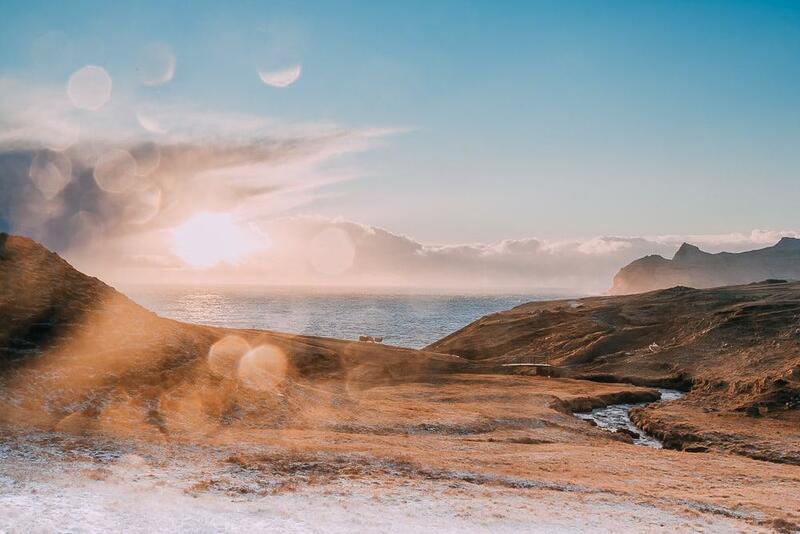 Funningsfjørður has a beautiful view of the fjords – if you can catch it when they aren’t shrouded in clouds. Pull over outside the entrance to the tunnel to Norðskáli and walk uphill a little to get the best view. I’d love to show you what it looked like, but by the time I got out my camera a storm had set in. I promise it’s beautiful though! 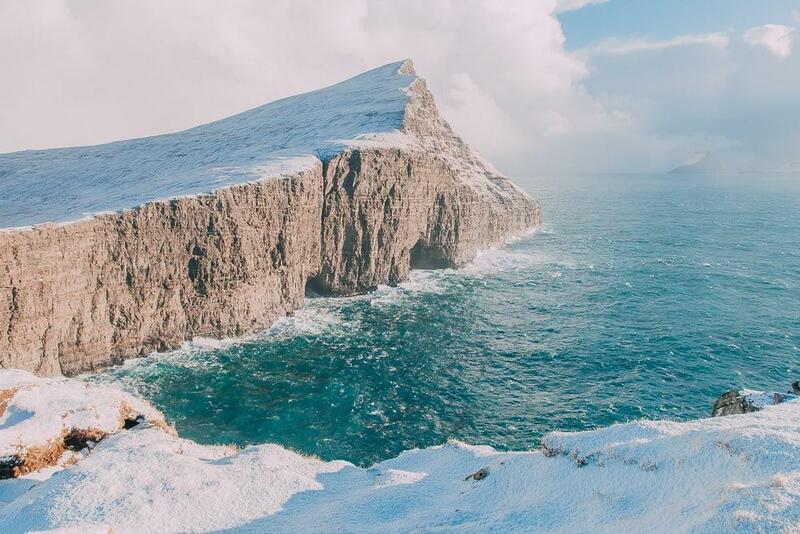 Even if you haven’t heard of Sørvágsvatn before, I bet you’ve seen a photo of it. 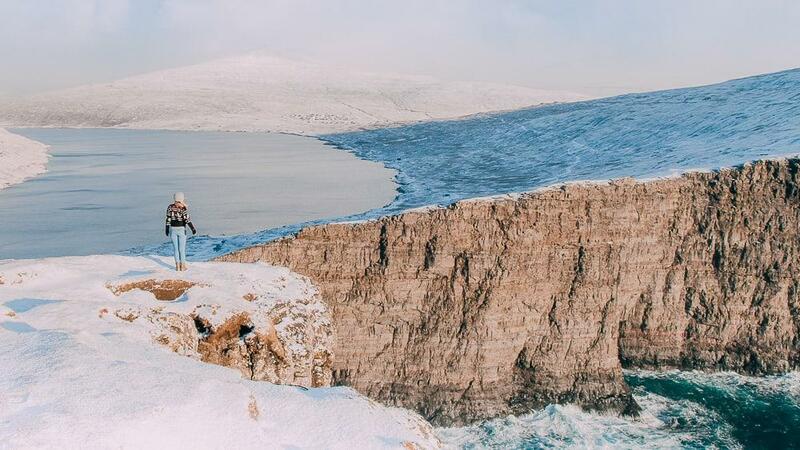 It’s the Faroe Islands’ famous optical illusion, where the lake looks like it’s lying on top of a mountain, when in fact it’s almost level with the sea. The hike up here is fairly easy, so I wouldn’t say you need perfect weather to attempt it – in fact it was hailing for most of my hike. I’d still try to fit this trip in on one of the better weather days on your trip, as to see the optical illusion you have to stand/sit/lie right on the edge of the cliff, which I imagine would be extra terrifying on a stormy day. But if it is raining you can still see the views, just from a safer distance to the cliff. And of course you’ll get a better view if it isn’t too cloudy. While you’re in the area, drive up to the Trøllkonufingur, or Troll Woman’s Finger. You can drive almost right up to the viewpoint, so you won’t need good weather for this one. 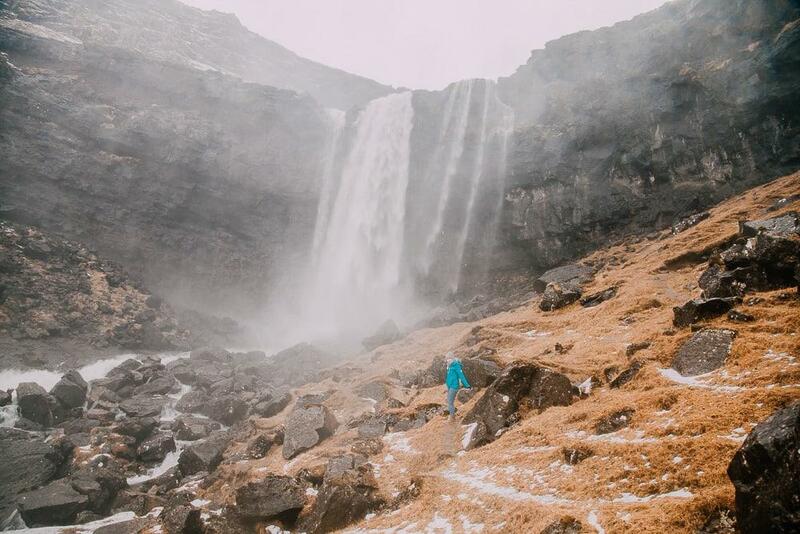 And then after Trøllkonufinger, drive down to Gásadalur, a small village that’s home to the Faroe Islands’ most famous waterfall. 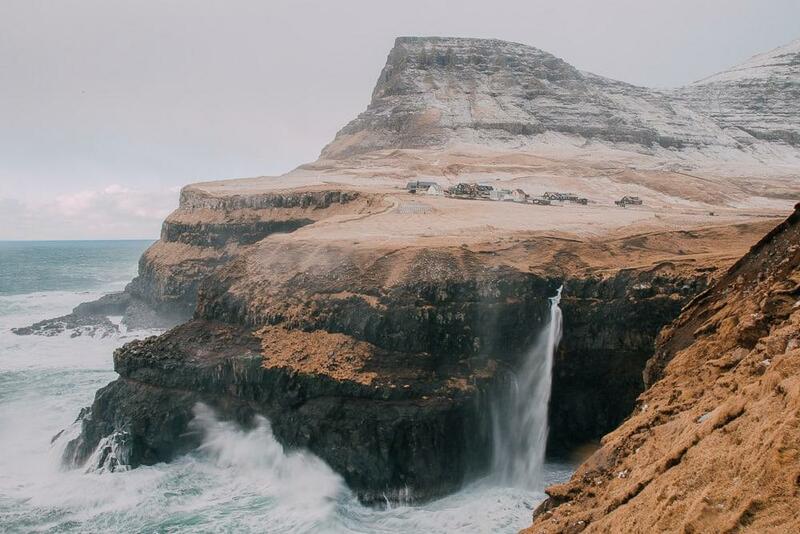 Like, if you think of the Faroe Islands, you are probably picturing this waterfall. To get to the viewpoint of the waterfall at Gásadalur, turn left at a dirt road before the village (don’t cross the river). You’ll see a space where you can park, and then simply walk down the gravel road towards the water. Don’t worry, it’s really easy to find. 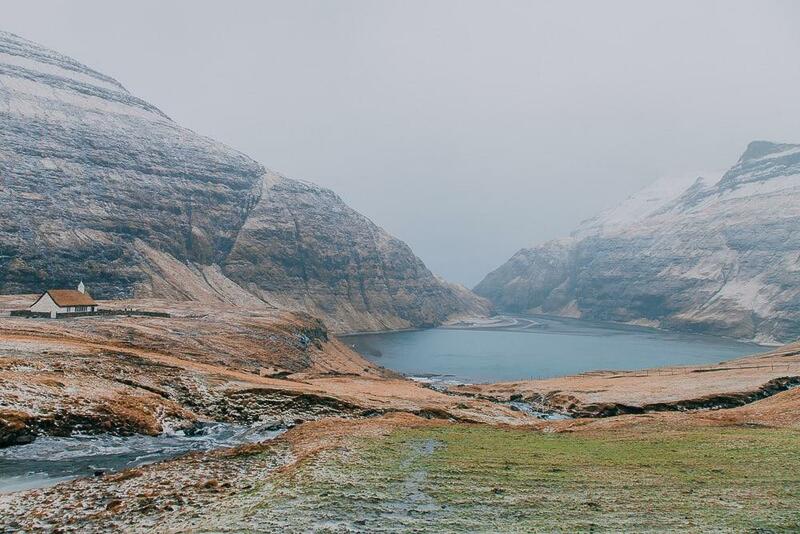 The northern islands on the Faroes are home to lots of dramatic landscapes, tunnels, and sheep, and very few people. I visited Viðoy, Kunoy, and Borðoy all in one day, as they’re all connected by roads so I didn’t have to wait around for ferries (which is why I missed out on Svinoy and Fugloy). I imagine you could enjoy all the views here in pretty much any kind of weather, so this could make a good excursion on a day forecasted for more rain than shine. 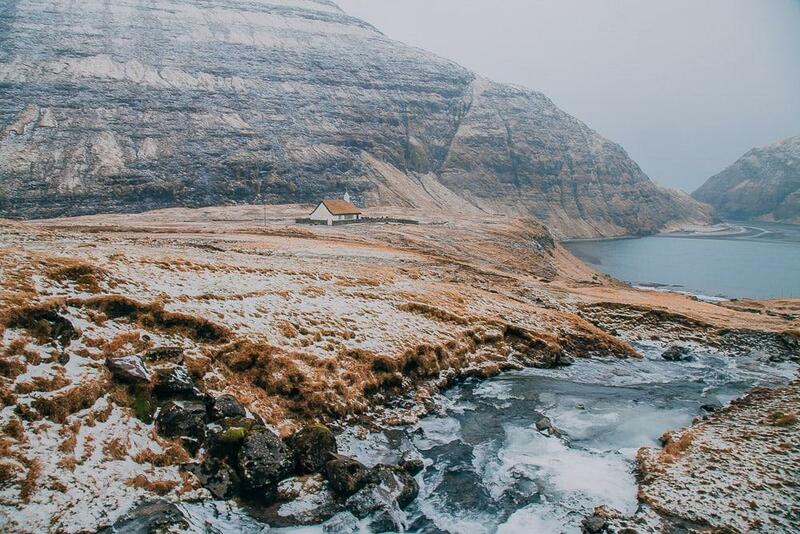 If I had to choose a favorite Faroe island, it would probably be Viðoy. It’s tiny, with fewer than 600 inhabitants, and its name translates to Wood Island – not because it has any trees, but because of the driftwood that washes up here from Siberia and North America. To be honest, there’s not a great deal to see on Kunoy (unless I missed something!) 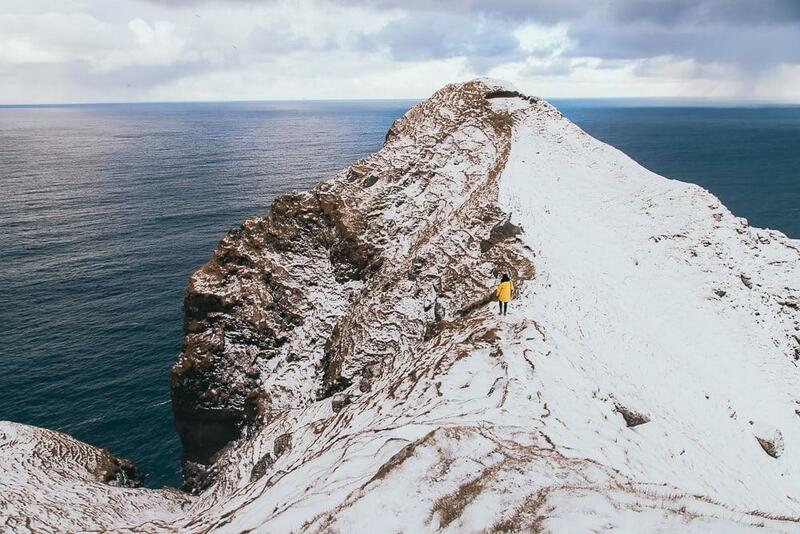 but it’s so close to Borðoy you might as well pop over to check it out. 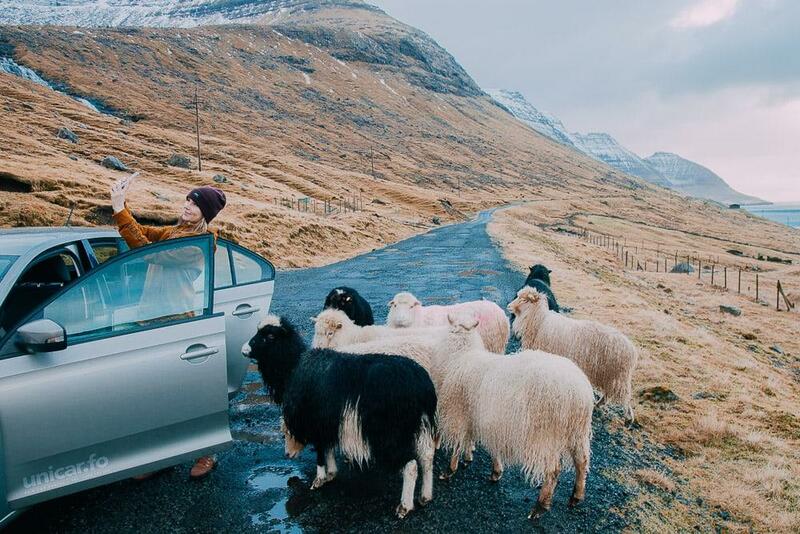 I loved driving around Borðoy, and it’s home to some very curious sheep! 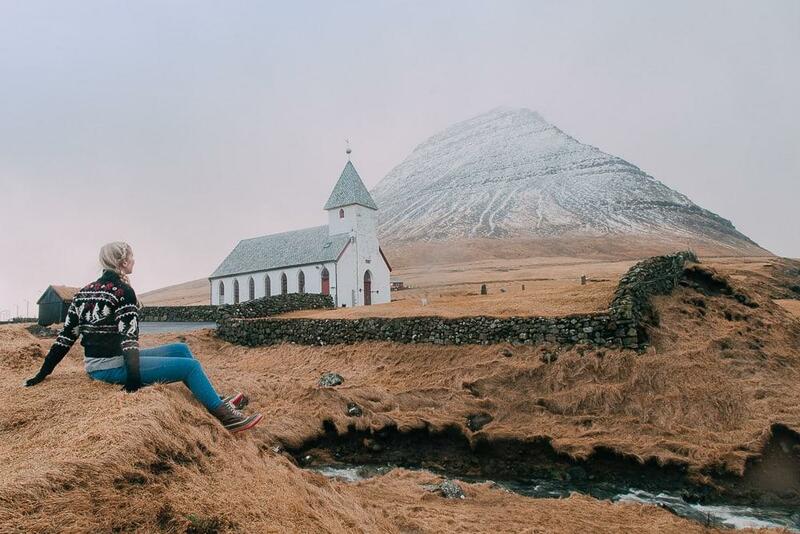 Klaksvik is also a cool town worth checking out. Plus if you’re in need of some outdoor gear they have an Intersport there! 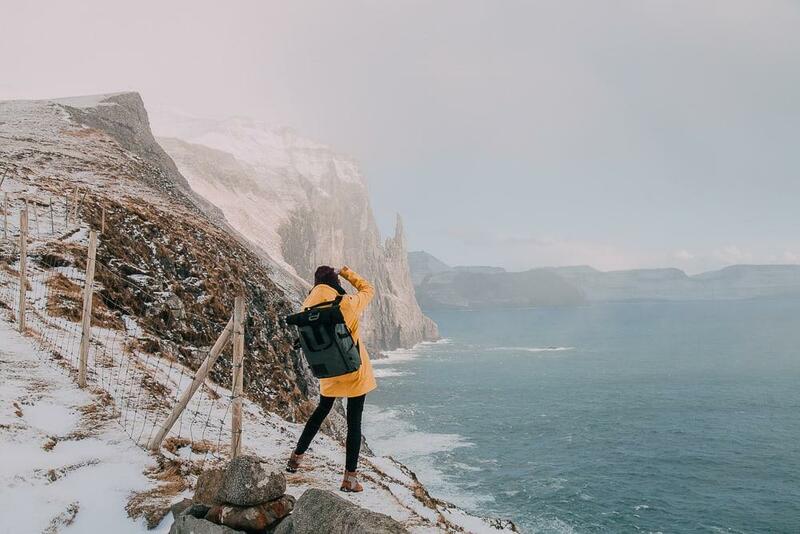 If you’re on the Faroes on a particularly stormy day but still want to see some nice views, head to Saksun! 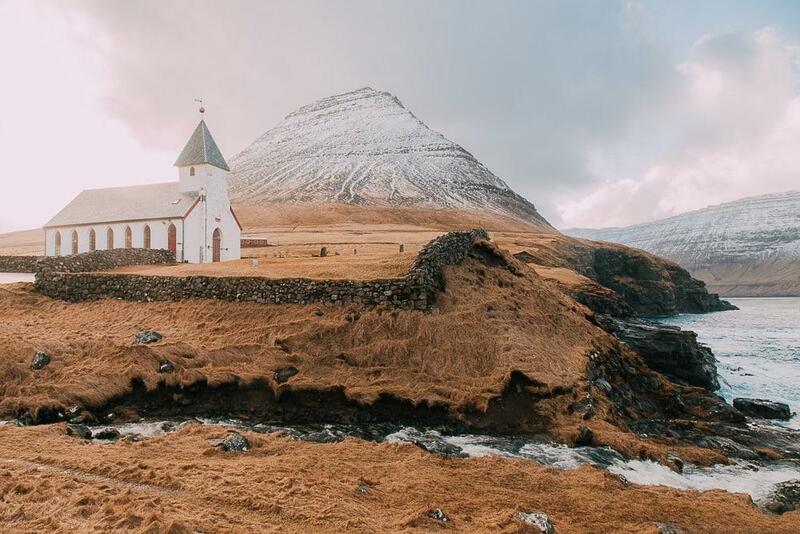 It’s a tiny village home to only eight people, but the drive there is beautiful and there’s a very picturesque church there. Okay, I feel like I should add that Saksun is also home to a famous grass roof house that is picturesquely nestled between two mountains, but to see it you will have to cross private property, and after the house became well known on Instagram, the locals have had to deal with a lot of tourists, which isn’t really fair. I mean, imagine if people were coming up to your house all day trying to photograph it. Not so nice, right? And it’s really unnecessary, because the church in Saksun is equally beautiful, and you won’t disturb anyone by taking a photo of it. 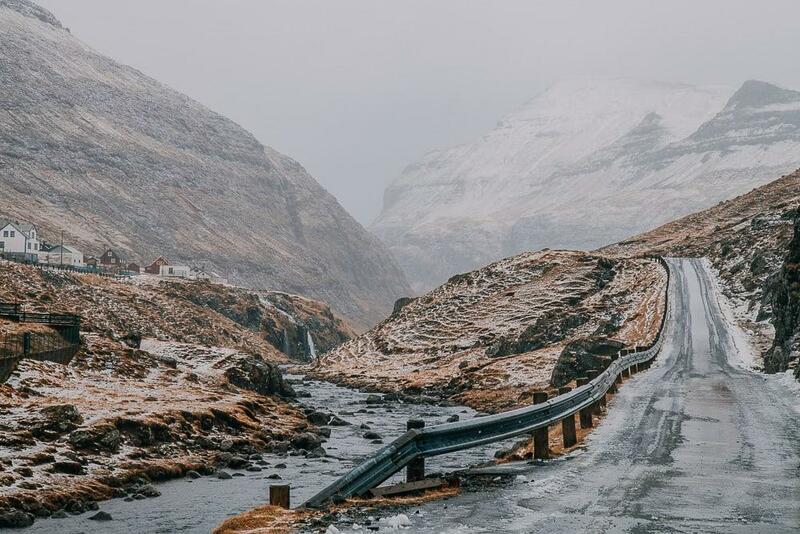 After Saksun you can drive up to the Fossá waterfall, which is one of the highest waterfalls on the Faroe Islands and only gets more impressive in the rain. Coming from Norway I wasn’t super impressed by the waterfall, but we have so many waterfalls here that they rarely do impress me. If the weather is extra treacherous (or not! ), Tórshavn is totally worth exploring a bit. The harbor is lovely, and Teru and I spent a very rainy afternoon inside a very cosy café downtown called Paname Café. There are also a bunch of shops here selling local goods like wool sweaters and blankets. I fell in love with a wool blanket but decided I didn’t really have room for it in my luggage, and to this day I still think about how I wish I had bought it! You can also get smaller items like mittens and hats if you’re also pressed for luggage space. The roads on the Faroes are really empty, so for the most part it’s an easy place to drive. Just be careful of snow and ice, and also be aware that in single lane tunnels you’ll have to pull over to let cars by. And you want to drive slowly through the tunnels and especially as you exit the tunnels, as the roads bend really quickly. Also, while parking on the Faroe Islands is free, some places do have a time limit, so you have a little parking disc clock thing on your windshield that you can set to the time you park somewhere (you can see it in the video above about Tórshavn). We rented from Unicar, who to be honest were a bit sketchy, especially when we were asking about insurance, so I’d recommend going with a more trusted name like Sixt instead. 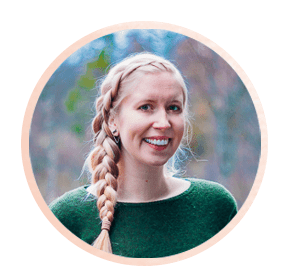 Since I wanted to keep my itinerary really flexible, I opted to stay at two central accommodations – one in Tórshavn, which offered easy access to the south, and one a bit farther north in Nes, for easy access to the northern islands. And I’m so glad I did this, because the Faroe Islands really aren’t that big, and it was so nice to return to the same place for a few nights in a row. I also simply loved both places we stayed in. 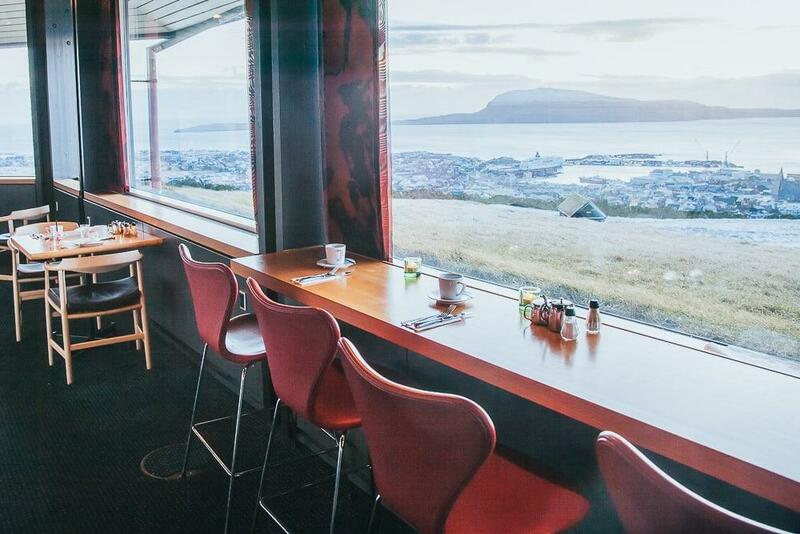 In Tórshavn I stayed at Hotel Føroyar, which I had heard is the nicest hotel on the Faroe Islands – and it really was beautiful! 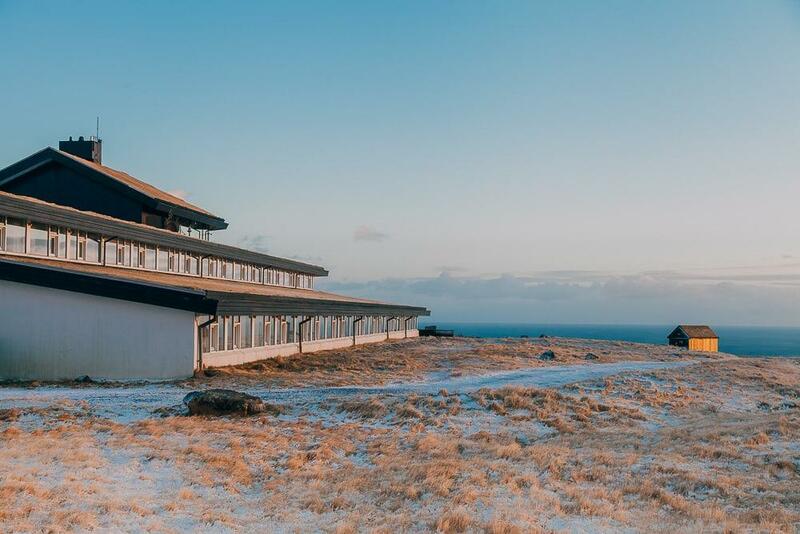 The hotel is built into the hillside and is meant to be like a puffin hole – the lobby area is really dark when you enter, and then you go down the hall to your room, which opens onto a beautiful bright view, just like a puffin hole. 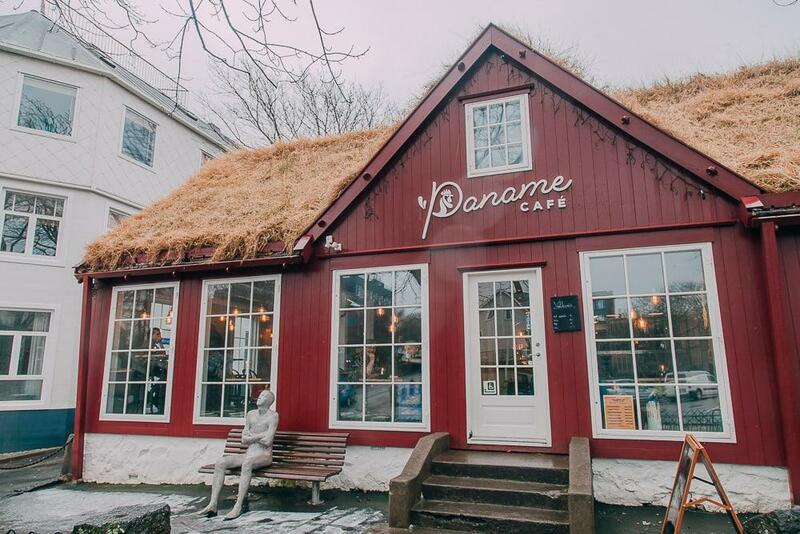 And all of the art on the walls are by local Faroese artists. The buffet breakfast was delicious, and the restaurant also has a wonderful view out over the ocean. Plus the staff are so friendly and helpful, and they ended up helping us a lot with figuring out where to go around the islands. And then in Nes we stayed at this Airbnb, which might just be the cutest Airbnb I’ve ever stayed at! 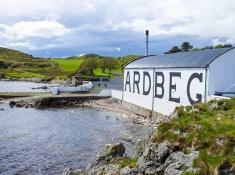 I loved it here and can highly recommend it, though be aware that there’s no shower (though the kitchen sink does have hot water if you want to wash your hair). Staying here definitely gave me a taste of the local culture here, as it felt like we were staying in someone’s holiday cabin. It was so beautifully decorated and had amazing views. It did get chilly at night because we were visiting in the middle of winter, so maybe bring some warm sweaters to wear to bed if you get cold at night. I found that on days where sun or partly cloudy weather was forecast, the weather changed really quickly. Sometimes I would arrive at a spot in a snowstorm, but twenty minutes later the sky would be totally blue. So be patient! But the two days I was there where rain all day was predicted stayed stormy all day, so I ended up doing very little on those days. 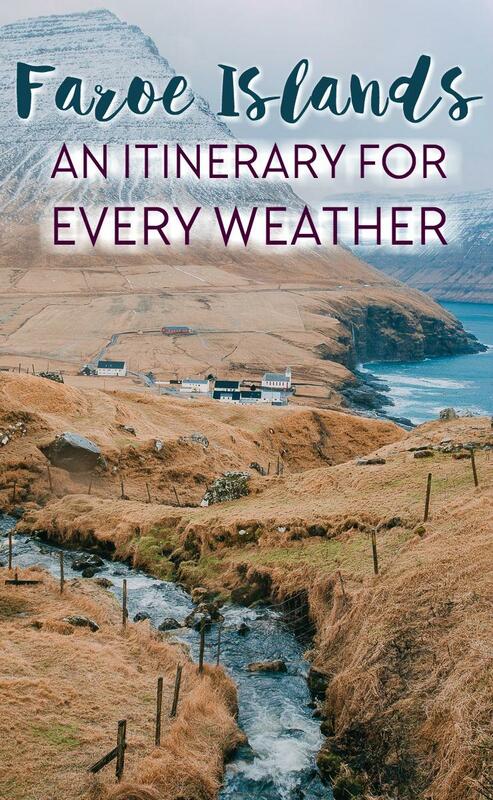 So if you have the time, trying to factor in extra time in your itinerary so that you won’t have to drop anything even if the weather is horrible all day. Nice article! 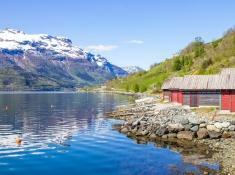 Faroe Islands are not that bad 😉 Weather sometimes makes troubles, but I love to go back there every year. That’s just magic place! Thank you for your article! 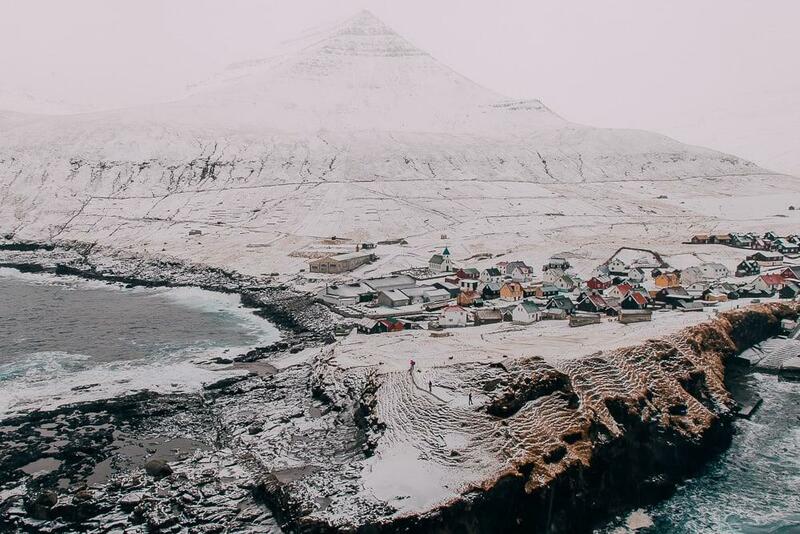 I always wanted to visit the Faroe Islands and after some thinking I’m going to go there alone in January, and I was afraid I was going to have bad weather the whole time. You showed me that having beautiful weather is also possible! Silvia! I love this post! Me and my fiancé love hiking, and we are planning a trip in January. 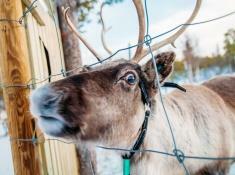 I was considering Faroe Islands but he was afraid due to the weather conditions. This post is very rich in information and will really help us planning! Awesome work! I’m now also following you on instagram and I love your account, so many gorgeous pictures! Hi, thoroughly enjoying your travels that I occasionally receive on email. I was born in Norway so especially enjoying your Scandinavian trips. I was wondering about your Kallur experience. You mentioned you went in February; were you the only people on that hike? How easy was it to “find” the trail — or did you basically just set off in a direction and go? There’s so much to see here… pretty sure I won’t be able to take it all in! I don’t mind having this many pictures in a blog one bit – they’re so beautiful! Before reading this and watching your vlogs, I really didn’t get why people would want to visit the Faroer, but now I can tell theyre a lot more spectacular than I always thought they were!